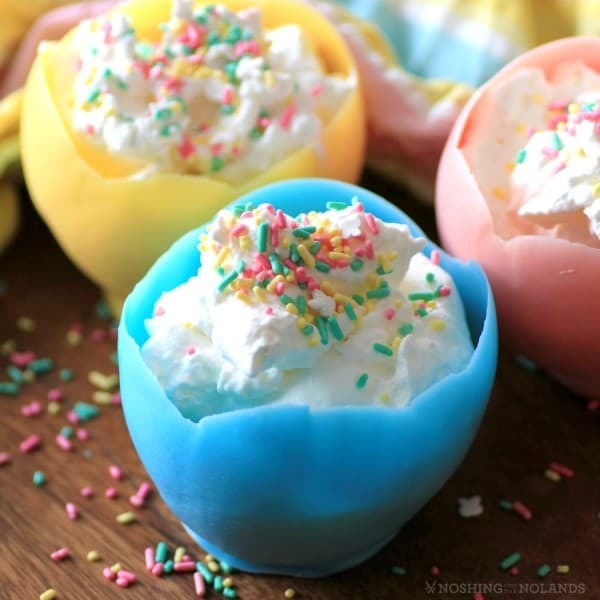 This little Easter dessert, Easter Cups with Lemon Curd and Cream, evolved from a project that my boss had asked me to make, Val from BonBon Break magazine. She wanted me to make a little woven egg using candy melts and a balloon. You blow up the balloon to the size just larger than an egg. Spray it with cooking spray and run a thin stream of chocolate in a woven pattern all over the egg. 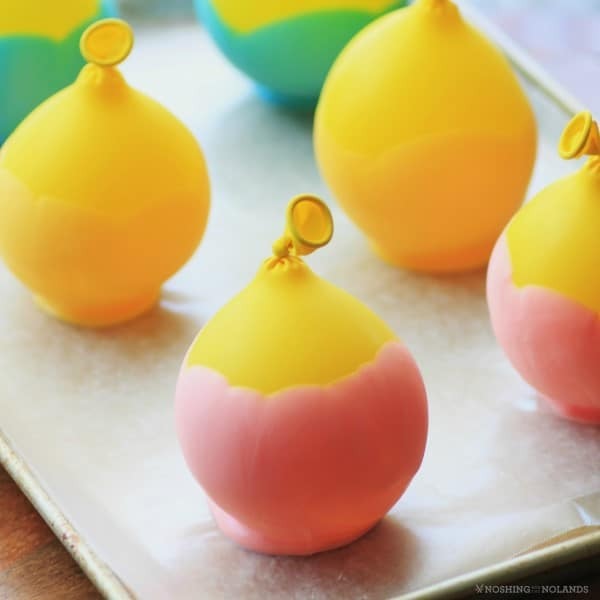 Once it has dried you pop the balloon and you can fill them with candies. Well, it looked good, great idea and off I went. EPIC FAIL!!!! This is what I ended up with. Clearly that project was scrapped but I had all the candy melts still, in pretty Easter colors so I came up with this idea. I had seen chocolate cups done like this on Foodgawker eons ago. I thought I would try these filled with delicious lemon curd and whipped cream!! Blow up balloons to desired size and dip repeatedly in melted colored candy melts (microwaved 30 seconds at a time and stir in between). You can spray the balloons with cooking spray first but they did come out for me with out it. Set them on wax paper to harden. The amount of chocolate you use will depend on the size of the balloons and how many you make. Pop the balloon when harden and carefully remove. Leave a little candy melts for repair if needed, mine were thin on the bottom but I just painted on some chocolate so there wasn’t a hole. Make your lemon curd and fill the cups dividing evenly for 6. The recipe was perfect for 6. You can make the candy cups in the morning and the lemon curd and then just assemble prior to serving. 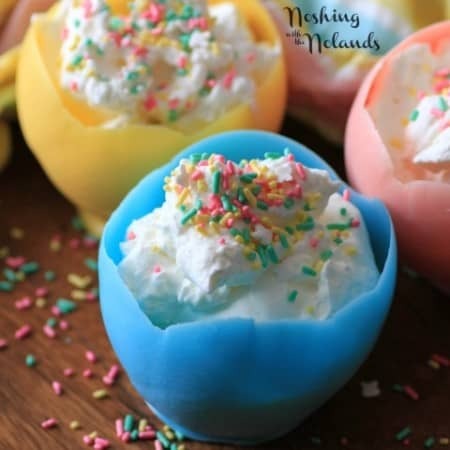 These turned out to be so fun and festive for Easter. I loved making them. Amber helped also and enjoyed eating them!! 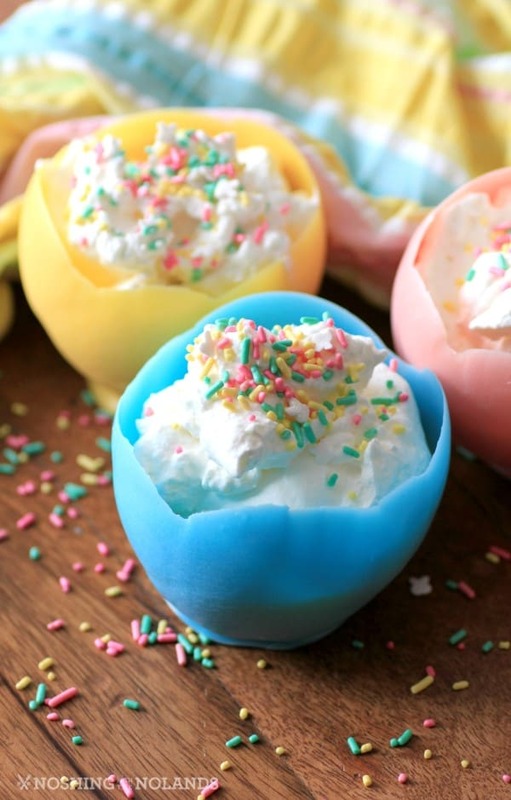 Whip one cup of whipping cream until stiff and just before serving top each cup and add seasonal Easter sprinkles!! 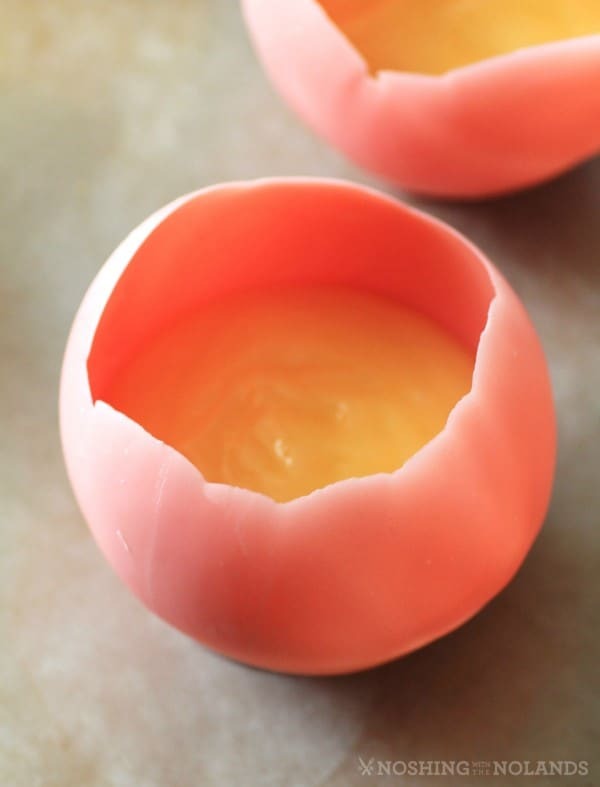 A fun Easter treat with fresh lemon curd and cream!! Zest three lemons finely, making sure not to get the white pith. Juice to get ½ cup lemon juice, you may need one more lemon. Mix the zest and sugar together. In a standup mixer with a paddle attachment cream the butter and then add the zest sugar mixture. Add the eggs one at a time, and then add the lemon juice. Mix well to combine. Pour the mixture into a saucepan and cook over low heat until thickened, approximately 10 min., stirring constantly. It should coat the back of a spoon and should thicken just below simmering. Remove from heat and place into a bowl. Cover with plastic wrap directly on the curd so a skin will not form. Refrigerate until ready to use. 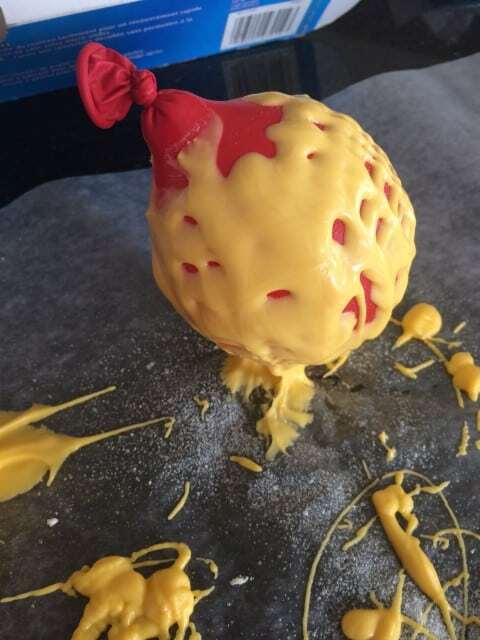 Blow up balloons to desired size and dip repeatedly in melted colored candy melts (microwaved 30 seconds at a time and stirred in between). You can spray the balloons with cooking spray first but they did come out for me with out it. Set them on wax paper to harden. The amount of the candy melts you use will depend on the size of the balloons and how many you make. Pop the balloon when harden and carefully remove. Leave a little candy melts for repair if needed, mine were thin on the bottom but I just painted on some chocolate so there wasn't a hole. Before serving fill each of the 6 cups with lemond curd. Top with whipped cream and sprinkles and serve. Thanks so much Jill, they were fun to make!! Thank you so much Debi, greatly appreciated!! Thanks so very much Bobbi!! I love you shared the story before the success. It made me laugh and love the final recipe even more. It was a pretty ugly thing to start off with. All was good in the end though.